In 2005-2007, Anthony Barnett, Glenn Tootle, Steve Gray, and colleagues at the University of Wyoming conducted a research effort to collect new chronologies in the upper Green River basin and generate streamflow reconstructions for the mainstem Green River and its headwater tributaries. Their work resulted in eight reconstructions of annual (water-year) streamflow, which are archived in TreeFlow. The Green River near Green River, WY gage (called "Q2" in Barnett 2007) represents most of the flow from the headwaters of the Green River. This gage was also reconstructed by Woodhouse et al. 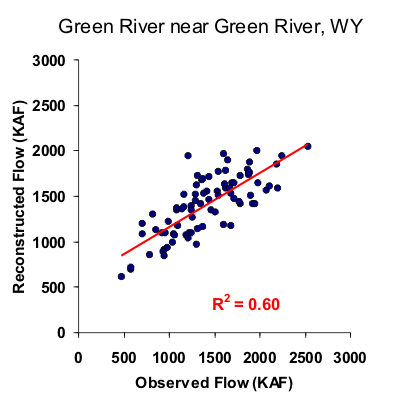 (2006) as part of their Upper Colorado River updated reconstructions, but their model explained only 48% of the variance in observed flow, compared to 60% for the Barnett reconstruction.